You can find the box art for all the other systems over on SEGA’s blog. Next Post > Next post: #114 Summer Of Sonic’s Full Crush 40 show! Woo hoo! Europe is getting it first! Nice…now I need to find a site that is taking pre-orders of the game. I think the real revelation here is that the boxart seems to be showcasing a stage like Green Hill Zone, Emerald Coast, Splash Hill, Emerald Hill, or Seaside Hill. SumoRex said that the background is not related to a level in the game. They nailed the cover. I was expecting an average box, but this one really is gonna stand out on retail shelves this fall. Overall reusing voice clips is somewhat of a downer ;c But hey, it doesn’t affect the gaming experience since its a racing game. I think that might have only been for the trailer. When we saw some game play for ASRT on PlayStation Blog, (or it might have been an interview w/Steve Lycett) when the game play music boosted up, I heard an UNFAMILIAR voice clip that I have never heard before. ALSO, when Steve Lycett was answering fan questions on SSMB, one fan asked about if ASRT will have new voice clips. Steve answered, saying that fans have asked for new voice clips since AST, and that SUMO has carefully listened to their feedback. The reason we hear old voice clips is because the CGI trailer was probably being made very, very early in development of ASRT, and SUMO had not yet recorded new clips, so they had and now have to settle with the old voice clips, but for the CGI opening only. Hmmmmm… I dunno guys, I think this box art looks pretty bland. I mean, you only have Sonic, Eggman, and AiAi, and then there’s Seaside Hill… again… EXCITEMENT! XD But either way, I’m glad we got an official release date and a new trailer, that’s all swell. The background is NOT related to a level in the game. Oh, okay, well that’s good. 🙂 But even still, the box art looks really dull… not to nitpick much… but yeah, it’s never the box art that matters. XD I mean, just look at Mario Kart DS, Mario Kart Wii, and Mario Kart 7. Boxart lacking the creativity SEGA is best at……how horrifying. SEGA Employee 1: Uh, uhhhh! What do we do?! 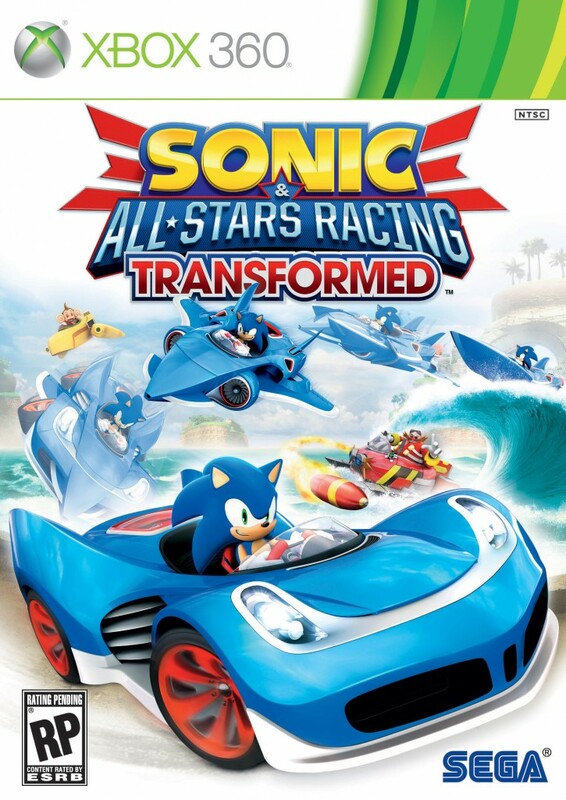 The cover will be completely ruined if we only have Sonic and Dr. Eggman on there! SEGA Employee 2: Uhhh, why don’t we just slap AiAi on there…? SEGA Employee 1: Great idea, Clive! Say, you’re a real expert on this box art stuff, what do you think we should make the background look like? SEGA Employee 2: *stares at Mario Kart 7 box art* I’ve got it, Bob! Hideous box art. Not that I’d expect anything less from the company that made the box art for Shadow the Hedgehog, Iron Man 2, Golden Axe: Beast Rider and Binary Domain. Hmm… the cover needs more NiGHTS. now if can get a trailer with Danica then we be set. *whipes drool* So, does anyone know if this will be cross-play compatible with the PS3 & Vita. Not that it really matters, tho, I’d still get BOTH, but it’d be nice to be able to utilize that feature like the way MVC3:Ultimate does where you can play against someone online either via PS3 or PSVita, at the very least. Hey, hey, guys… if this comes out on the 20th/16th of November…. does that mean the Wii U will also come before then? 😀 Because, well, I’m looking forward to getting this on the Wii U. So is there any word on a new core Sonic game.I know there was talks of a new modern Sonic,basically Sega’s plans to reboot Sonic.Is this still going on or what ,I know it’s off topic but hey I gotta know ! Anyone notice that this version doesn’t have the PS VITA logo at the end? All the versions I’ve seen elsewhere have the VITA logo included. HOORAY FOR RECYCLED VOICE CLIPS!!! I can’t wait for this! Haha I had a feeling this would be released in November 😀 Think I’ll now start playing the first game again while we wait :)….just less than 5 months to go! The box art looks quite cool but I think I slightly prefer the box art from the first game but this is still good! 🙂 Hopefully Seaside Hill won’t be a returning track and I don’t want to see Green Hill Zone either. What’s happened to the Wii U version?